I spent most of January 2012 fighting sinusitis, unable to take advantage of unseasonably warm weather for day hikes. Finally, four weeks after my previous day hike on New Year’s Eve, I had recovered sufficiently to contemplate hiking on the final weekend of the month, which again arrived weirdly warm, reaching the upper 50s on Sunday. I knew I didn’t want to travel too far, yet I hoped for something novel. A perusal of the map showed I’d exhausted most of the nearby opportunities in Oklahoma. So I scrolled the map north into Kansas. Many months ago the husband of my friend and coworker Betty Henderson had mentioned there were trails at Big Hill Lake near Cherryvale, and I settled on them. I spent Saturday doing laundry and reading a thin volume Betty had given me: The Benders: Keepers of the Devil’s Inn. It told the particulars of a group of four serial killers, an older couple and a younger couple, who set up a one-room Hell House on the Prairie near Cherryvale in the early 1870s and set about doing away with passersby on the Osage Trail linking Independence and Fort Scott. They evidently murdered 17 people over three years, mostly by hammering in their skulls and slitting their throats. They successfully fled the scene before locals caught on and were never held accountable. The house was dismembered by souvenir hunters, but their hammers are in the Cherryvale Museum and almost all of their victims are buried at Benders Mounds just north of Big Hill Lake. I wouldn’t be driving by those mounds, but instead focused on the Ruth Nixon hiking trail located five miles south of them along the west shore of the lake near the dam. There is also a 17-mile bridle trail around the north end of the lake, but I couldn’t find any online trail maps, just a biking trail site saying the bridle trail is shaped like an H with the cross-segment along a gravel road across the lake called Rea Bridge. So I wasn’t sure if I could reach the bridle trail from the Nixon trail or not. I arrived at the dam overlook at 10:15 a.m. and followed the signs to Pearson-Skubitz Big Hill Lake. Only a government bureaucrat could think of such a terrible name. Everyone really just calls it Big Hill Lake after the Osage Indian leader Pa-In-No-Pa-She (Not Afraid of Longhairs), or Big Hill Joe as he was known by whites. The band of Osage Indians he once led lived in a village a few miles to the northwest before their land was purchased/stolen and they were shifted south into Oklahoma in 1872. I have no idea who Pearson or Skubitz were; Public Law 95-625 gave the lake that terrible prefix without bothering to say why. It turns out my camera was not focusing properly for the first part of my hike. I suppose it is as out of practice as I am after weeks of convalescence. So my shots of the arched observation platform and panorama from it had to be sharpened in Photoshop. I located the south trailhead for the Ruth Nixon Trail nearby, with a nice big trail map sign revealing that the trail hugged the shoreline northward to one of the parking areas for the bridle trail. So I could extend the roughly one-mile trail from there. I was immediately greeted by a broken-down bridgelet and the discovery that the trail area had been burned over. So it is no great tragedy that my camera was on the blink and I can only offer post-sharpened images of the denuded surroundings and a burned-down tree. I trudged northward to where the lake has not been cleared for boats and finally reached a long fishing berm where the trail came to an end. I located the bridle trail parking area, where I was told the trail was closed from 10/30-12/11 and 1/1-1/8 during the firearm deer seasons. I was well out of that, so I continued northward some distance from the lake on the blue-blazed horse trail. The trail followed the fence line long enough to worry me that it would not be worthwhile, but then turned toward the lake. Along here I spooked a group of five deer a couple of times, seeing their white tails rapidly bobbing away. I’d not used the many benches along the Nixon trail and wondered where I’d sit down for lunch, but then right about noon I found a sawed stump where I could sit down and eat. After continuing northward only a bit more, I began hearing many nearby gunshots. They were close enough to be unnerving and I donned my orange cap and vest and reversed course back to the trailhead, finding an alternate route to avoid most of the fenceline section. I hope those shooters were having better luck than I: hours later, when I downloaded what I had in my camera, all I found was a blurry mess. I’d hiked 7.75 miles but it wasn’t even 2 p.m. yet. Based on the poor winter scenery and gunshots I had no interest in hiking other parts of the trail system, but I had read about a new trail system being constructed just north of Parsons at Tolen Creek at the junction of highways 59 and 400. So that would be next. I drove half an hour over to Parsons, pausing to look at the doughboy at the courthouse and then found the unmarked turnoff for the Tolen Creek Trails. This area is under development, with wide gravel trails and associated bridges under construction. It is currently somewhat unprepossessing and afflicted with highway noise, but once the trails are finished and more grass is planted it will make for a fairly pleasant two-mile walking loop excepting the noisy aural environment. There is an old stone house there, built in 1895 and renovated in 2006 for use as a farm history center. There didn’t appear to be much inside when I peered into the windows, but the tiny old house does have a big grand chimney. I liked how they had curbed the trail around the big fishing pond with rough rocks; I don’t know if they plan to line the entire trail that way, but it would make it look nicer. A new bridge with a bowed rail plank led across the creek to the unfinished east part of the property, which wound around to two more large bridges where I encountered some fellow walkers. I walked north under highway 400 past a Little Feather graffiti tag and took the unfinished north loop, where I found two old chairs sitting beside the trail. Not your traditional bench, but they would do. I sat down for another snack and then walked on around over another bridge being built which looked like it led to the nearby Wal-Mart Supercenter. 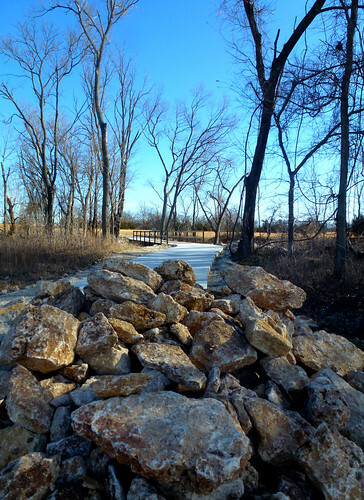 I admired the pile of stones awaiting placement at its far end, and was glad the trail turned aside from Wally World and headed back toward the fishing pond. A bluebird hopped beside me from branch to branch for a bit and then I passed a father and two children doing what comes naturally at a fishing pond. I’d walked two miles, bringing my total for the day to almost ten miles, and I was feeling fatigued. So I headed home, stopping off in Independence for a refreshing dipped cone at the Dairy Queen. When I arrived home I could tell I was out of shape from my month without any hikes and collapsed for a short nap. I quickly recovered, however, and was ready to edit photos and compose the blog post. I’m rather disappointed that my camera, which up to now had been a strong performer, is having focusing issues. Most of my later shots at Tolen Creek were fine, but a few showed the same lousy focus which plagued all of the shots at Big Hill Lake. It may be time for a new camera. If I do invest in one, I’ll steer away from a Panasonic Lumix this time, although I’ll insist on another pocketable one with superzoom and built-in GPS.